Let us give thanks to the Lord our God. It is right and just. The priest greets us, and invites us to join him in the Eucharistic Prayer. Our desire to share in the Eucharistic Prayer and sacrifice, as indicated by our response “it is right and just”, must be expressed so that the priest may continue with the Mass. After all, the Mass is not the work of Christ and the priest, but of Christ and his Church – all of us incorporated into Christ through baptism. While there are only a relatively small number of options for the Eucharistic Prayer, with some only permissible on specific occasions, there is a larger collection of prefaces. The Preface leads us into the Eucharistic Prayer by declaring to God (and at the same time reminding ourselves) the reason we celebrate the Eucharist at this particular time. On most days, they typically reflect the liturgical season we celebrate. There are, however, also prefaces for particular feast days, for saints, for the dead, and for a range of other needs and occasions. The Preface then concludes with our prayer of acclamation, the Sanctus (or Holy, Holy). In the new translation of the Sanctus, the opening phrase has changed from “Holy, holy, holy Lord, God of power and might” to “Holy, holy, holy Lord God of hosts.” This, like other changes, reflects a closer match with the Latin text. It also reflects what the priest proclaims immediately before; that what we do in celebrating the Eucharist is not done alone, but in communion with the angels and saints – the entire “heavenly host”. How does one find the English text of the Eucharistic Prayer for a funeral Mass? In the Roman Missal there are five options for the Preface of the Eucharistic Prayer, all being Prefaces for the Dead. These are located at the end of the collection of prefaces in the Order of Mass (in the Catholic Truth Society edition used in Australia, England, Wales and Scotland, these are on pages 656-665). Eucharistic Prayers I, II or III can then be used at a funeral Mass (Eucharistic Prayer IV has its own preface which cannot be replaced with another one, so the other three prayers are better options). Eucharistic Prayers II and III have an extra paragraph which may be added in Masses for the Dead. Following the style of each respective prayer, the additional text in EPII (Order of Mass, #105, p 682 CTS Edition) is rather brief and to the point, whereas the text in EPIII (Order of Mass, #115, p 689 CTS Edition) is longer and more poetic. As for sourcing the text itself, you would need to get your hands on a copy of the Missal itself, subscribe to one of the liturgy preparation websites that provide the text (eg LiturgyHelp.com in Australia) or purchase a liturgy preparation software package (eg LabOra Worship in Australia). 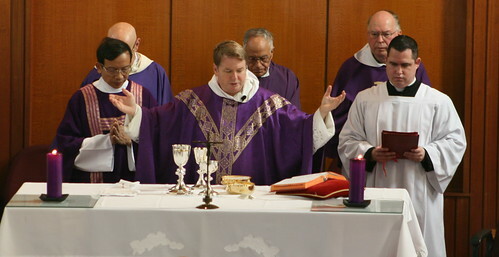 While some parts of the Order of Mass may be available on the web as an aid to Catholics, or even as a smartphone or tablet app, copyright prevents large amounts of the Missal text (especially the presidential prayers that the assembly listen to rather than recite themselves) from being freely distributed.